Notwithstanding the hype in the New York Times — “the strongest action ever taken in the United States to combat climate change,” “an aggressive plan to sharply limit greenhouse gases” — the final version of the US EPA “Clean Power Plan” being released today at the White House by President Obama actually constitutes a marked slowdown in reductions in electricity-sector emissions. According to published reports, the administration plan calls for a 32% reduction in U.S. power-sector CO2 emissions in 2030, relative to actual 2005 power-sector emissions. That’s slightly more ambitious than the 30% reduction envisioned in the initial Clean Power Plan released in June 2014. 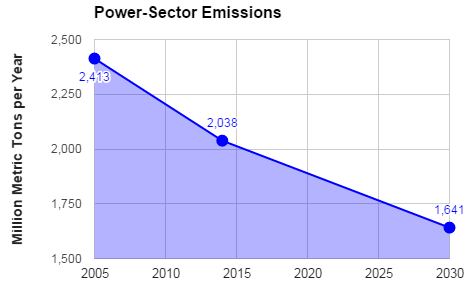 Since 2005 power-sector emissions were 2,413 million metric tons (MMT), the targeted 32% reduction would be 772 MMT, or 7% of total projected U.S. emissions (from all sectors) of 5,684 MMT (projected by CTC in the absence of a U.S. carbon pollution price). Emissions will fall 40% more slowly, under the Clean Power Plan rules released today. Nearly half of that reduction has already been achieved, however. Actual 2014 U.S. power-sector emissions were 2,038 MMT, or 375 MMT less than the 2005 baseline level of 2,413 MMT. Expressed on an annual average basis, power-sector emissions of CO2 fell during 2005-2014 by 42 million metric tons a year. To fulfill the total 772 MMT 2005-2030 reduction target, the “remaining” 2014-2030 reduction in power-sector emissions need only be 397 MMT. The implied annual rate of reduction over the next 16 years is just 25 million metric tons a year. That’s 40% less than the actual annual 2005-2014 reduction rate in power-sector emissions of 42 MMT per year. It is probably true that we’re not likely to see a repeat of two factors that contributed to the 2005-2014 reduction in power-sector emissions — the long and deep recession that began in 2007-2008, and the advent of cheap fracked methane that grabbed market share from higher-polluting coal-fired generation. But two other emissions-reducing phenomena remain in full swing: ongoing cost reductions in carbon-free wind and solar photovoltaic power, and the harnessing of both digital tech and new business models to boost energy efficiency in buildings, appliances and businesses. In this light, it seems premature, if not downright bizarre, to bestow “legacy status” on a plan that targets just one sector (albeit a key one), and that settles for cutting emissions in that sector at a lesser pace than the rate at which they’ve already been falling for a decade. Extremely well stated and compelling. Thanks for making this important point. It imprecindível action is taken in this regard. The USA is one of the carbon -emitting mayors and still is one of the countries least concerned with the climatic effects . It’s a shame that all the technology we have the usa is not used to reduce a more effective rate carbon emissions .